Weebirdie's Café | a Japanese home baker living in Belfast. I made this cake once nearly two years ago for my husband’s birthday, and I remembered that I thought this might be ‘the one’. So I tried a few times more with different creams and then I forgotten about it. When I thought about a birthday cake for a friend of mine a few weeks ago, I remembered this cake. It’s a recipe from a BBC bake off winner, Jo Wheatley, and you can get the recipe here. This is a chocolate sponge cake with cream cheese + passion fruit frosting. It is quite sweet but the passion fruit give a nice sharpness. A real treat for a birthday party. In original recipe linked above, the sponge is baked in a 20cm tin and sliced into three. But I used two of 18cm tin, and slice a cake into two to get four layer. I also pipe the cream with a large round nozzle to decorate. I thought this is a perfect cake for grown-up party, but in fact, my kids and friend’s grand-children enjoyed it, too. As long as you like a passion fruit, this cake is a wonderful treat for a special occasion. I haven’t been posting for long time on here or my FB page, but I just had a busy baking week and I thought I would sit down and record what was going on. We moved the house last July to an old bungalow which belonged to my father-in-law from our house in Belfast which we lived about 7 years. The house is in the country, about 30 minutes drive from Belfast. This is where my husband grown up and where our boys’ Grandad had lived. Every Easter, ever since my boys are big enough to run around and developed the love for chocolate, we came to this ‘Grandad’s house’ for Easter. Our garden in Belfast was small and Grandad’s garden was bigger (and likely to have more rabbits living nearby), so we would bring a basket each for boys to collect eggs, hot cross buns and a simnel cake to share. Grandad would come out to the garden even if it was bit chilly and stand at the corner of his house to watch boys run around his garden looking for chocolate eggs. This year, we are living here. No Grandad now but we did the same as before, with same cake and same buns. Simnel cake is a strange one. It is apparently a traditional cake for Easter, but I think it actually became known about 5 years ago or so. I don’t know if this cake was once popular and forgotten OR it was only baked in certain part of UK and became known widely recently. But we like rich fruit cake and burnt marzipan, so it became our Easter tradition. A few more days of Easter holiday left. Boys are running around in the Grandad’s garden. I wonder if I should make another batch of hot cross bun before the school starts. I didn’t intend to abandon this blog for so long. I meant to put some cakes I baked for ages but I haven’t got around to it. There are many excuses, but one big change is now I post on my Facebook page (Link on my sidebar, if you are interested to see what I am up to) if I am just posting a picture of a cake I baked. It is quicker and suits me at the moment. But I am back here today!! Because I got a recipe I want to introduce. It was one of my little baker’s wonderful idea. We checked the instruction on how to break it, and got nice fresh coconut. Fresh coconuts is so moist and milky, much nicer than desiccate coconuts in a packet. My son had some ideas to what he wanted to use this coconut, so we followed his first instruction, which was ‘mixing coconuts with melted chocolate and fresh cherry’. Second idea of his was simply ‘making a cake’. So, we followed a recipe by Delia Smith. And the cake was so nice that I actually went to buy another coconut to make this cake again. Yum yum yum…. It was good. The recipe below is slightly changed from the original recipe in above link. freshly grated coconuts…..60g or so. Pre-heat the oven to gas mark 3, 170C (325°F). First of all, push a skewer or nail into the 3 holes in the top of the coconut and drain out the milk. 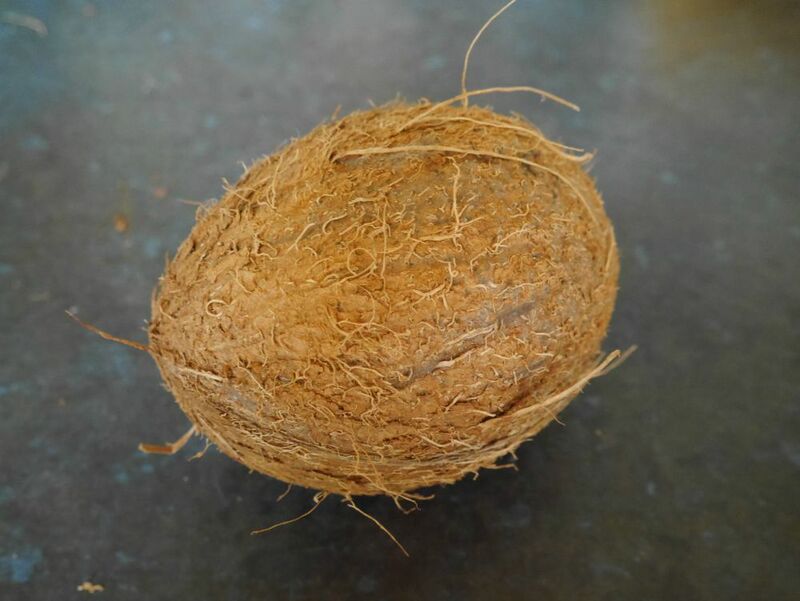 Then place the coconut in a polythene bag and sit it on a hard surface – a stone floor or an outside paving stone. Then give it a whack with a hammer – hitting natural line you can see on the coconut will help. Now remove the pieces from the bag and, using a cloth to protect your hands, praise the top of a knife between the nut and the shell. Now discard the shell and take off the inner skin using a potato peeler. The coconut is now ready to use. Grate coconut flesh is with the grating disc of a food processor or a hand grater. I used a hand grater, fine grate side. Add sieved flour and baking power to the mix. 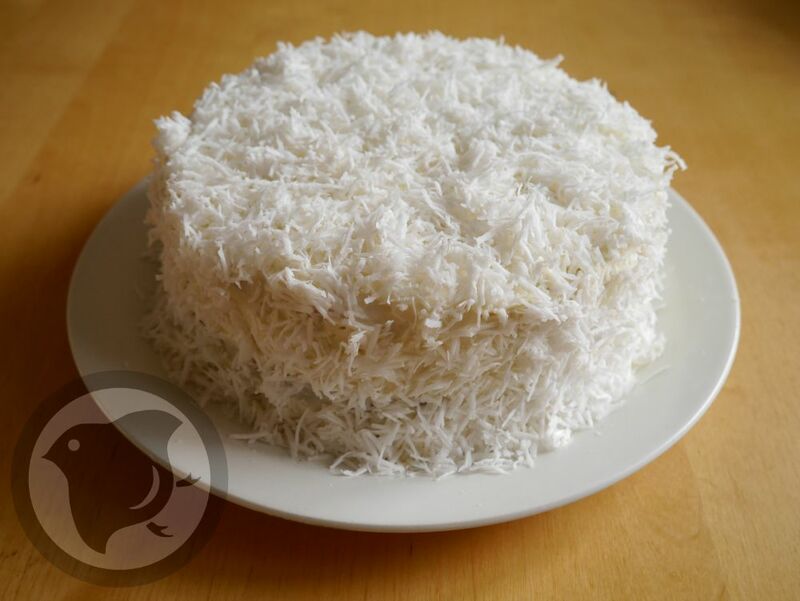 Add grated coconuts and milk, make sure it is nice soft consistency. Divide cake mix into two 20cm tins, bake for 25-35min, till a skewer comes out clean. I had a few wonderful surprises last couple of days. First of all, my birthday was a few days ago (that is not really a surprise I know when my birthday is), my boys baked me a cake. It wasn’t completely a surprise as my wee one couldn’t contain his excitement, told me that he was going to bake a cake for me with his dad. 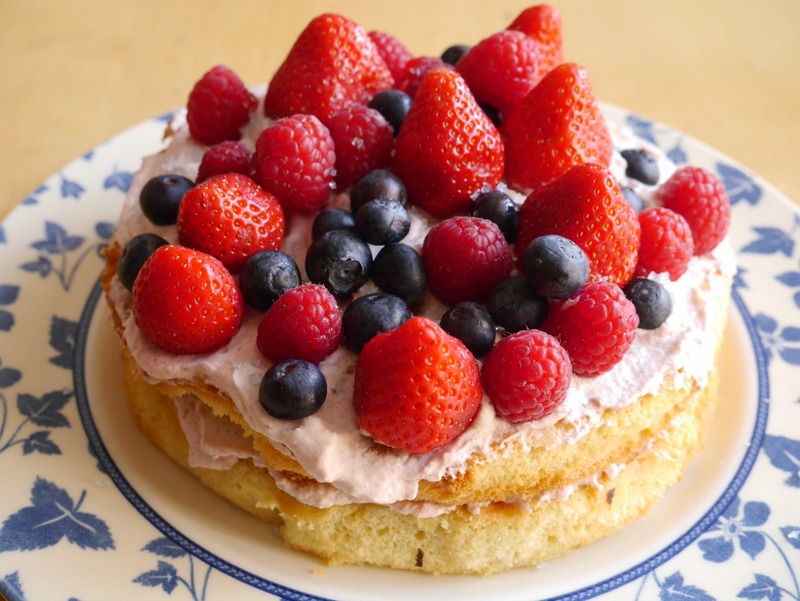 It was lovely butter cake with whipped cream mixed with jam, and topped with lots of berries. We had this cake as a dessert at the end of my wonderful birthday. Thank you, D.
Then, when I went to my local green grocer next day, they already knew that my birthday was a day before, as my husband and wee son went there to get some strawberry to put on the cake. We chatted about this and that as usual while I shopped. 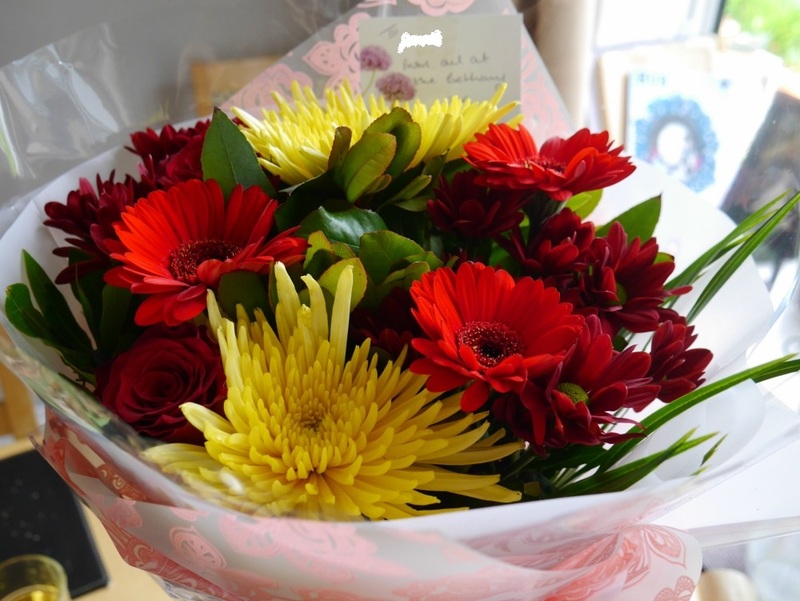 Then by the time I was ready to go, a stuff of the shop came back in with a nice bunch of flower for me. I lost for words for a second, it was such a wonderful shock. They gave me the flower to wish me a happy birthday. It was their ‘thanks’ for the cake I made for their 20th business anniversary last month, but still, it was very kind of them. Thirdly, last night, we had a big surprise in our garden. A little hedgehog was in our garden!! We are soooooo excited and happy to see this little visitor. Hope he/she stay nearby. Now, back to my baking. 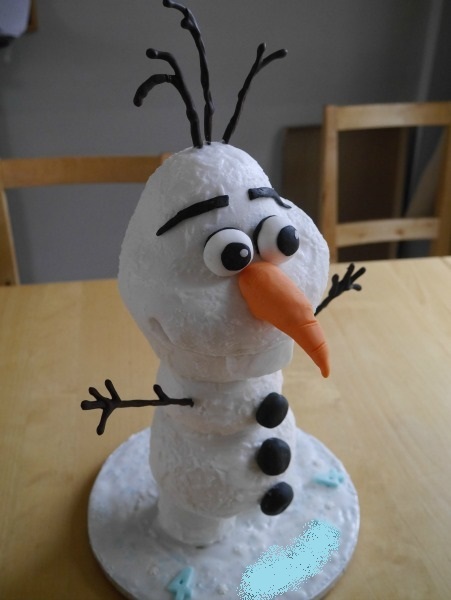 In the last post, I mentioned that I made not one but two Olaf cakes last month. This was a request from my friend. She showed me a picture of 3D Olaf she found on web, and asked if I could make something like that. I didn’t follow the exact instruction word to word, but the tutorial is very good, and it helped me to make him somehow. Base is vanilla Victoria and vanilla butter cream. I used fondant and then royal icing to give him texture as it was on the tutorial. I used a 30cm threaded bar with 6mm nuts. It does sound like DIY project not cake making, but I did needed those stuff to make him standing. I cut normal drinking straw and used it to cover the threaded bar. Eyes, eye blows, buttons, nose are made with fondant or flower paste. I used black, ready colored icing bought at the shop. His hair and hands are made of chocolate covering spaghetti for strength. When my friend came to pick him up, she was shocked to see he was as big as he was! She liked him very much, but in fact, he was a bit too big and too heavy to be transported safely at the back of her car. She had to come back again with her husband to pick him up, and she needed to hold him all the way home. Well, this Olaf had an impact for sure…but he needed to get to the house in one piece. So next time, I shall make any 3D cakes much smaller in order to transport it safely. 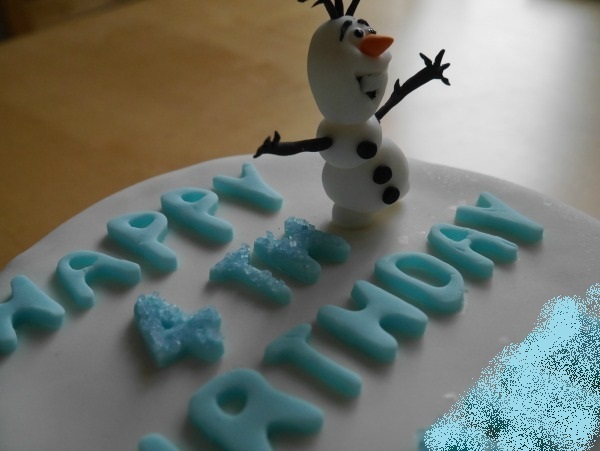 Well, in the end, Olaf got home safely, and I heard that the birthday boy was happy with this Olaf. 🙂 Happy birthday boy means my job was done! And I am bringing this to Fiesta Friday 68, right on Friday this week! Yay! Thank you to Angie and this week’s co-hosts Justine @ Eclectic odds n sods and Jhuls @ The Not So Creative Cook. A good friend of mine asked me to make cakes for her son’s 4th birthday. 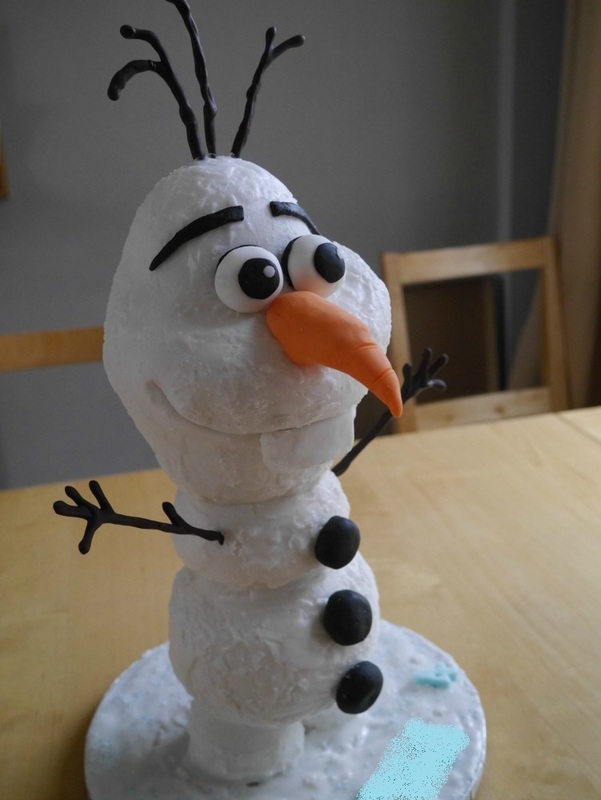 He likes Olaf from the movie Frozon, and she wanted to have Olaf on his cakes. And this is the one I made for his school. 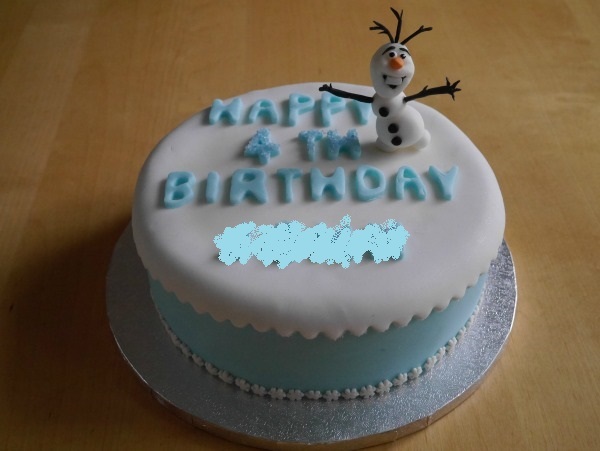 I decorated the cake with small fondant Olaf I made, blue sugar crystal on his name and ‘4th’ bit, and sugar snowflakes around the bottom. 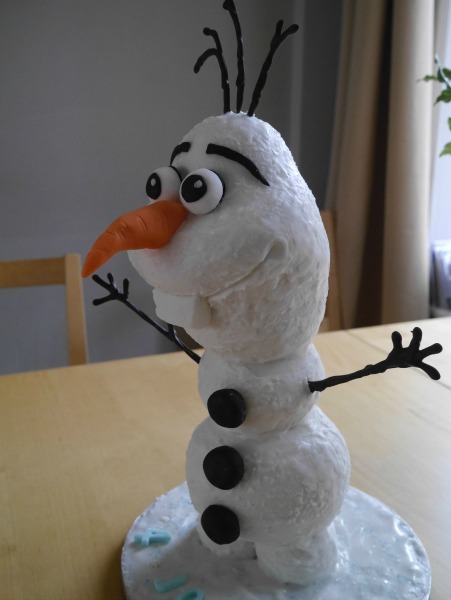 All to make this simple cake ‘Frozen’ worthy. 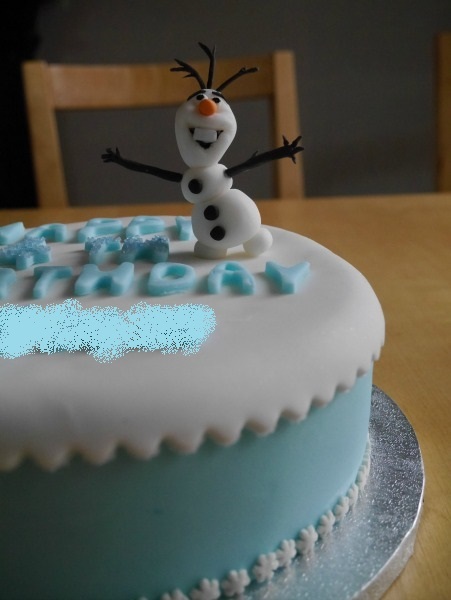 I don’t often make fondant character, but this small Olaf was simple enough to make myself. (I only can say that because I made bigger Olaf before making this version.) Various video tutorials on line were really helpful. Hope you enjoy the weekend, and Fiesta Friday 67. Thanks Angie for hosting as usual, and another big thanks to Caroline @Caroline’s Cooking and Jess @Cooking Is My Sport for being co-hosts this week. I made this cake in winter, and it was sitting on my draft for some time. It is already May, but it is such a wet and cold day today in Belfast, I might as well post this now. Gâteau au chocolat simply means chocolate cake, probably any chocolate cake. 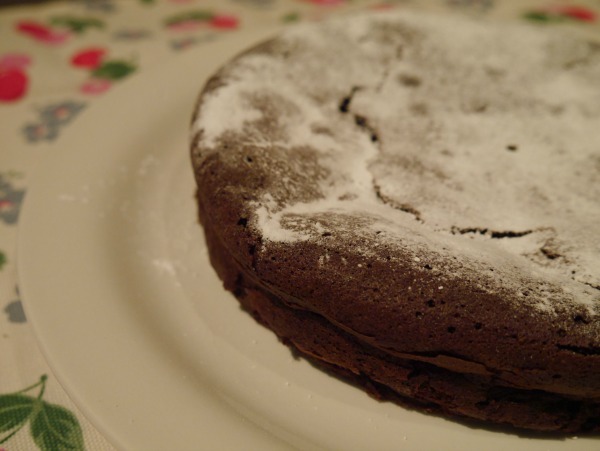 However, somehow in Japan, when you say ‘Gato Shokora (Gateau au Chocolat)’, it means a dark rich simple chocolate cake, usually with crack or dent on top covered with powder sugar, served with whipped cream. It is very chocolaty and rich but not heavy. Quite grown-up sort of cake. 1.Chop chocolate into small chunks, and put it in a clean bowl with butter. Melt using double boiler (with water about 50C), or microwave. Do not over heat. 2. Mix cocoa powder and plain flour, sift them together, make sure there is no rumps. 4. Add egg york to melted chocolate&butter (1). 5. Mix 50g of caster sugar, half at time, mixing well after each half. 6. Add whipping cream, and mix till all combined. 7. Make meringue using egg white and sugar (50g). 8. Add small bit of meringue to 6. 9. Then add flour and cocoa mix (2), mix with spatula. 10. Add the rest of meringue and mix with spatula. 11. Put the mixture into the tin, bake in a oven 165C, for 40 minutes or so, till a skewer comes out clean in the middle. .
12. Remove side lining paper while warm, and leave it to cool. 13. Top with sifted icing sugar, and serve with cream or ice cream. Gateau au Chocola is often served with whipped cream, as the cake can be crumbly and rich without it. 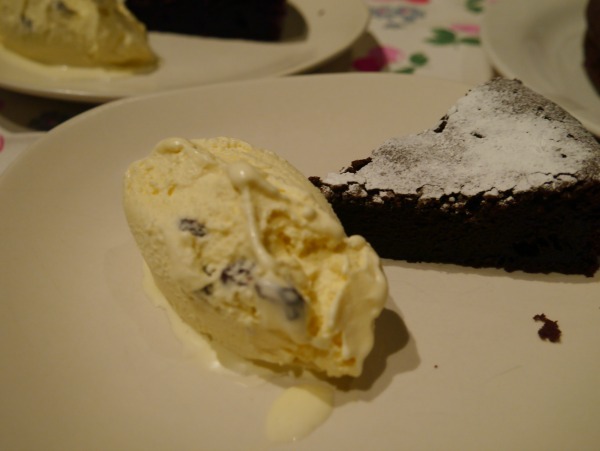 But I decided to make it a bit special & grown up by serving it with rum raisin ice cream. I made the quantity half of original recipe. It looked like this amount was good for ice cream maker I used. And it was plenty for me and my husband. I have to say, this was the nicest rum raisin ice cream I had for ages. It is worth a try. It is a May bank holiday weekend in the UK. Yay! This is a cake I made last month for a 4 years old girl, as a birthday present. I have seen this type of cake before online, and loved to try it, but as I havn’t got any girls on my family, I haven’t got any opportunity until recently. 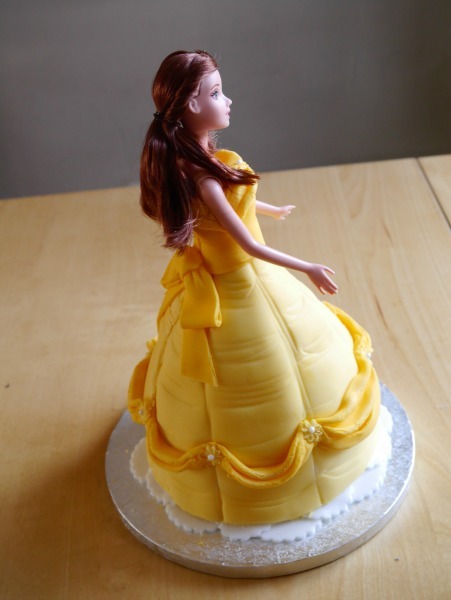 As I saw my friend’s daugther playing with her barbie, and hearing that she dressed up as a princess for her school’s fancy dress event, I thought the doll cake will be great for her birthday this year. 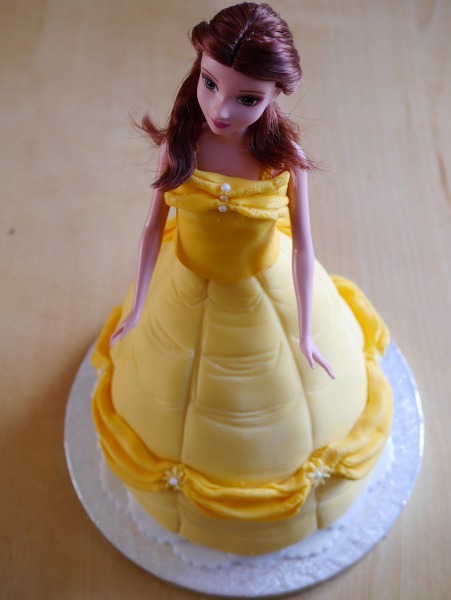 Well, it is a cake and a doll, so it should be a hit with 4 years old, isn’t it? I bought a Belle swimming doll (usual doll, but had swim wear on) at the shop, and wrapped her up in cling film and tin foil. Then build a cake around her leg to make dress. I have to say, my icing job here isn’t great at detail. My whole effort was spent to shape the sponge into a big skirt shape, and covering it with icing somehow. Hopefully I’ll do better job if I got a chance to make one again. Inside of the skirt is vanilla victoria sponge with raspberry jam and vanilla butter icing. 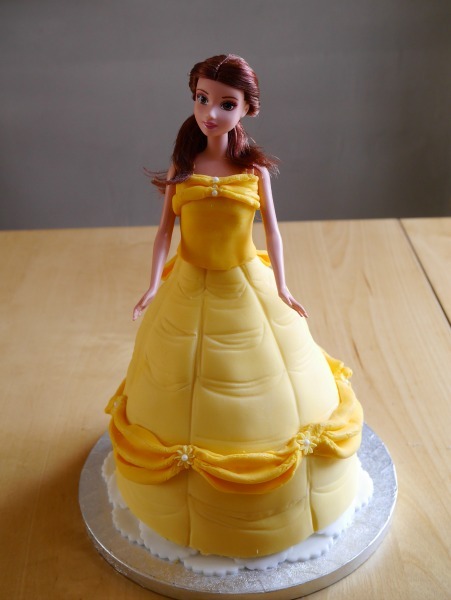 The dress is made out of fondant icing. I was pleased to hear that the birthday girl was very happy with the cake and she played with the doll after eating the cake. Well, if the birthday girl was happy, my job is done!